The spawn of Chielo, district Centro. Inspired by another building I found on Planet Minecraft. I liked it, but it was too small, too simple and so on... so I started to build this one with bricks, sandstone, lots of water, decoration, etc. 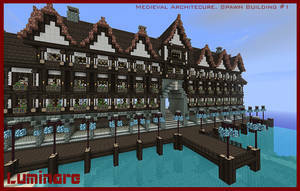 I have to admit, that I used WorldEdit for the glass cupola. Everything else was placed block-for-block. "Wolkenhalle" is German and means "cloud-hall" - hall in/above the clouds. Welches txp ist das wenn man fragen darf?